"Chosen and edited by Edward Espe Brown, author and student of Suzuki's, the lectures are taken from the last three years of Suzuki's life. His maturity as a teacher with a deep commitment to conveying his message is warmly and fully expressed." "In Not Always So, Suzuki voices Zen in everyday language, with humor and good-heartedness. While offering sustenance much like a mother and father lending a hand, Suzuki encourages you to find your own way. Rather than emphasize specific directions and techniques, his teaching encourages you to touch and know your true heart and to express yourself fully. 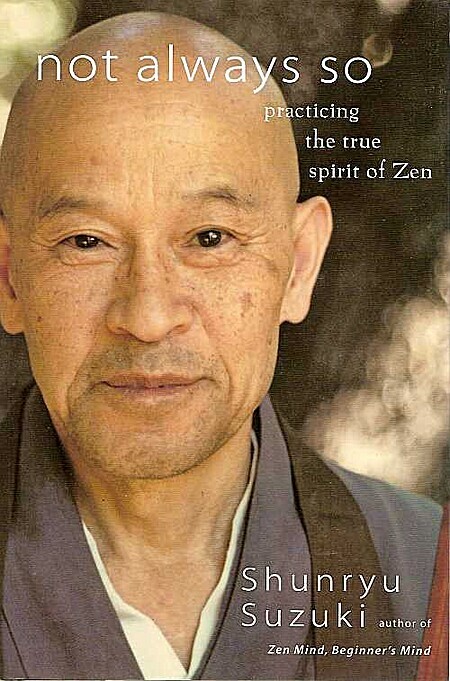 Suzuki's words do not seem to come from outside, but awaken a voice arising from your own being." --BOOK JACKET. This collection of dharma talks was deep and interesting reading. I read one talk nightly while on a seven day meditation retreat. When you cannot get a talk from your own teacher, it can be good to listen to the wisdom of others.